"Is it part of your healthy diet plan?" 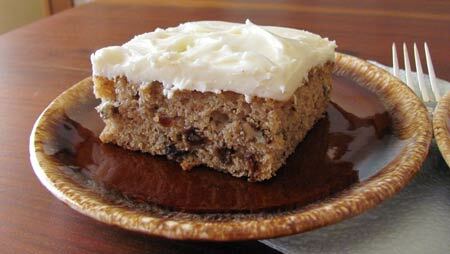 This is one serving size of Applesauce Cake with pecans, raisins and cream cheese frosting, on a 7 inch plate. Does the small slice look like 25%? I didn't think so after looking at this, so I weighed it on my postal scale and it is 25% of the total weight. You don't have to throw out your easy dessert recipes, like this one, to achieve ideal weight. Applesauce, pecans, raisins add beneficial fiber and nutrients and make this a filling dessert. In fact, I've eaten this for breakfast in a pinch and found it kept me going until lunch without an energy crash. You could easily reduce the portion size of this cake by 50% and not miss it. But let's look at a 25% portion size reduction and see what happens. Make this exchange everyday for a year and lose 13 pounds with no other diet or exercise changes. 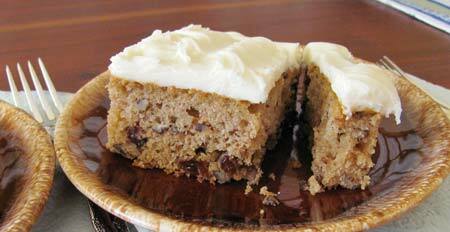 To take off an additional 61 calories per slice, reduce the frosting by half for a 332 calorie piece of cake. You save 192 calories and lose 20 pounds in a year. And still have cake! For portion reduction to work, consistency is more important than perfection. Reduce portions everyday to maximize weight loss results. If you leave a little less than 25% or a little more, it will even out as long as you consistently apply portion reduction to your diet. Don't weigh or measure your food. Instead, visually measure 25% and leave it on your plate. Simple.